Compaction Type: Electrically driven vibraters with hydraulic pressure. Controllers: either hand level controls or programmable logic. We offer fly ash bricks Making Machine. These Clay Brick Making Machine Machine are manufactured using high quality raw material and can be availed at very economical price. Production rate: up to 4 cycles per minute. Maximum mold Area: 500mm/450mm with plain plotters. Pellets size: 600*550. Product depth: 40mm up to 230 mm. As per your cavity die. Over the years, we have acquired prominence for offering a qualitative range of Industrial Machines, Panels and Plants. 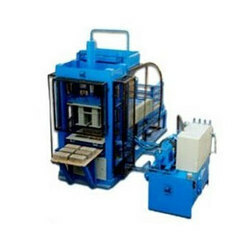 Our comprehensive gamut encompasses Hydraulic Concrete Block Machine & Fly Ash Bricks, Power Pack Control, Concrete Block Pressing Machine, Pan Mixture Machine, Fully Automatic Clay Bricks Machine, Control Panel and Double Shaft Clay Mixing Plant. Our range is reckoned for excellent performance, reliability and convenient operations. Owing to organized operations, state-of-the-art manufacturing facility armed with latest machinery, best business practices, hassle-free transactions, we have been able to attain highest level of client satisfaction. With constructed efforts of our dexterous team, we have been carry out operations in a streamlined manner, and have achieved organizational targets well on time.